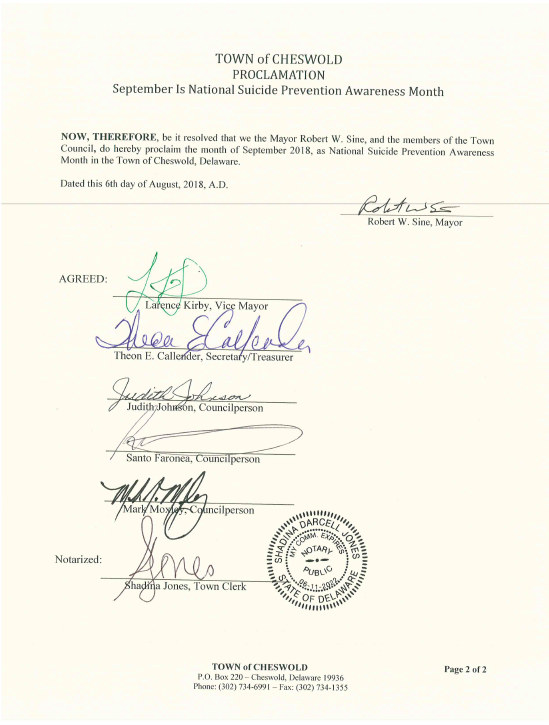 On August 6, 2018, at the Town Council Meeting, Mayor Sine and the members of the Council signed a proclamation declaring September to be National Suicide Prevention Awareness Month in the Town of Cheswold. 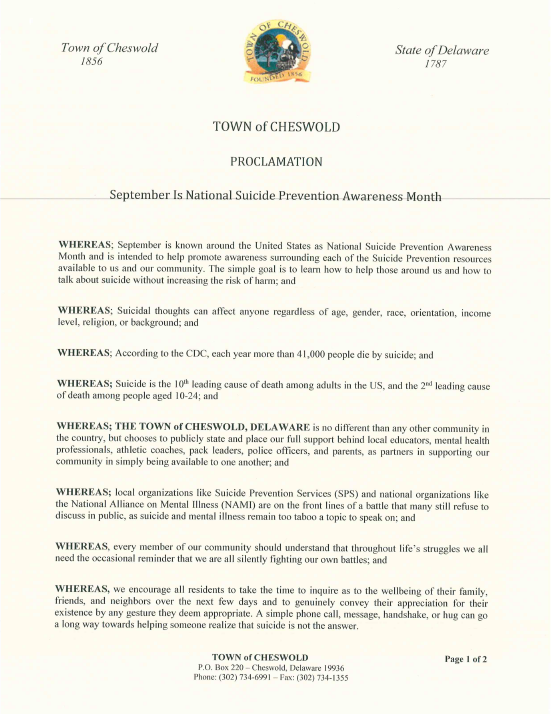 This is in line with the observance of September as National Suicide Prevention Awareness Month throughout the United States, and is intended to raise awareness of the resources available to us and our community. During the month of September, we encourage you to reach out and check on your family, friends, and neighbors. Sometimes a simple gesture, like a phone call or a text message, can make a big difference to a person who is struggling. While this can be a difficult subject, we would also like to encourage our community to talk with one another. We never know what another person may be going through, but we can work together to show support. Suicidal thoughts, much like mental health conditions, can affect anyone regardless of age, gender or background. In fact, suicide is often the result of an untreated mental health condition. Suicidal thoughts, although common, should not be considered normal and often indicate more serious issues. Each year, more than 41,000 individuals die by suicide, leaving behind their friends and family members to navigate the tragedy of loss. In many cases, friends and families affected by a suicide loss (often called “suicide loss survivors”) are left in the dark. Too often the feelings of shame and stigma prevent them from talking openly.